With my last post on Bluehost, I found myself looking to see if whybluehost.com was still around. Whybluehost.com was a site that was trying to push other people to do their affilate work, and offering other people a chance at an iPad if they signed up through the for a bluehost.com account. Turns out there is a generic place holder up where the site used to be. A place holder filled with ppc ads. This site becomes a cautionary tale of why it does not pay to spam. A tale of looking beyond whats being offered. Bottom line buyer beware!!! This was the site that promised me , if I sold I sold 25 hosting accounts with Bluehost.com that they would give you an iPad (cheapest model) and $550. Unfortunately that would have been a step down for me as I had the deluxe model of the first version, and never mind going straight through Bluehost.com’s own affiliate program I would get $1,625 at $65 per sale on 25 sales (now its $2250 at $90 per sale). 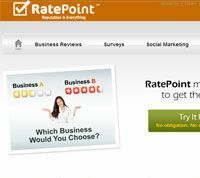 Like most companies that choose to comment spam where ever there is an opening they have no idea who gets their spam. So as karma would have it, he spammed me. Back in June 2010 I was still warming up to doing some regular blogging. It did not take much inspriration to make a post on this affiliate. As I really hate spam. Last year not sure the exact month, I am assuming late July or early August. 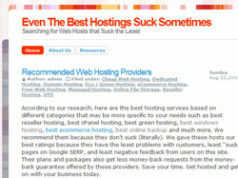 But whybluehost.com went up for sale on Flippa. There are a few things that are wrong with this site, as the seller was far less then honest. These sales were achieved without any type of AdWords campaign or traffic building techniques. The site was literally sitting on my “to do” list and it got sales without me having to lift a finger.I strongly recommend that the new owner of this site to take the time to build targeted traffic and run an AdWords campaign to maximize the best results. As you can tell no one came in to make enough sales to get a iPad. But he lied about “The site was literally sitting on my “to do” list and it got sales without me having to lift a finger.“. You can go to my orginal post to see that he was going around spamming through YouTube. It appear the site sold for a whopping $150. 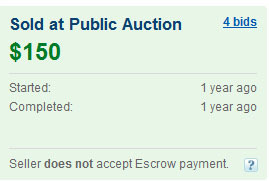 Frankly I would avoid buying from someone on flippa if they do not accept Escrow. If memory serves me correctly, there was a claim of giving out an iPad. Granted I did not take a snap shot, and the original site was gone. 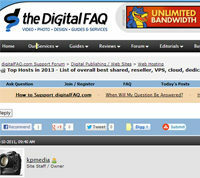 Now more then a year later the site has become nothing more then ppc page holder until the domain expires. Want the chance to win an iPad? So, here’s the deal! The first 25 people to purchase Bluehost hosting through whybluehost.com will be entered into a fair and unbiased drawing for a free iPad. You can find the video by searching youtube.com for “whybluehost”. I had contacted this affilate, and made it clear that he could go directly to Bluehost.com and make more, but he made it clear he did not care. 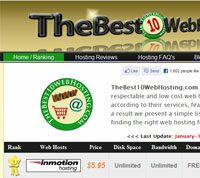 In the end whybluehost is an example of using cation when it comes to hosting review sites. Never mind this was someone that wanted other people to do his sales work for him, and pay less the more someone sold. Or the fact that he was not even hosted on Bluehost.com. From the stand point of being an affiliate, what is going to stop a person from going directly to bluehost.com to find they could earn more? I can’t say I was worried too much about affiliates finding out what I did doing 2 minutes of research most of which involved finding my calculator. My biggest problem is I notified bluehost,com and never received a response on any action they might take to remove whybluehost’s affiliate id. Would have been nice to know they had taken action against whybluehost. 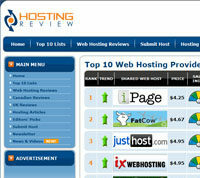 Previous articleBluehost.com another EIG company seeking FTC compliance? 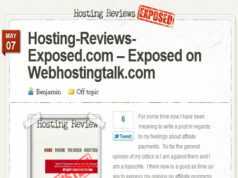 Next articleHostmonster.com – Another possible EIG host seeks FTC Compliance.